Last updated on April 16, 2014 September 10, 2018 by Daniel Waldron for Armagard Ltd.
Reduce the risk of PC, printer or screen damage in your workplace. This classic industrial computer cabinet provides everything you need for all-in-one equipment protection. Your unique industrial computer cabinet, designed and manufactured by Armagard, provides a solution for protecting PC, printer and screen equipment simultaneously. This classic Armagard product allows you to create your own unit that suits your environment and safeguards against any hazardous threats that can cause damage to your PC, printer or screen apparatus. Armagard’s classic industrial computer cabinet. 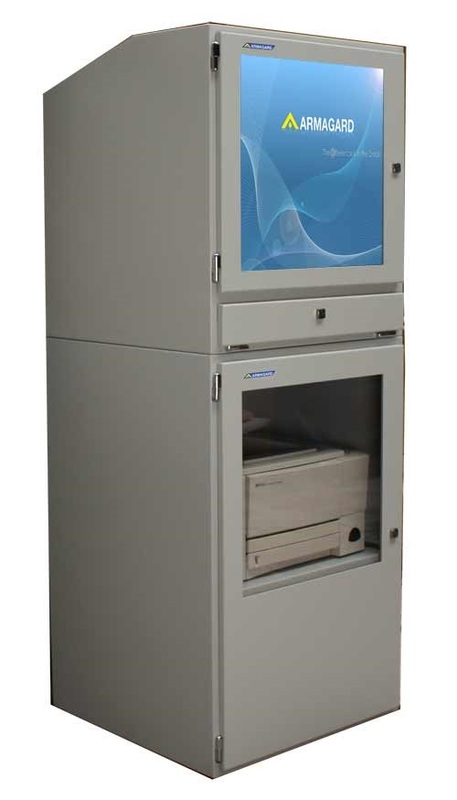 Protecting against water damage, dust, dirt and physical impact, your industrial computer cabinet is manufactured using powder coated mild steel and is sealed to IP54 industry standard. The unit is a powerful fortress, built to withstand the impact of arduous working environments. Besides safeguarding against environmental elements the unit also has various features that protect against vandalism and theft. Compared to similar units on sale this industrial computer cabinet is unique and offers more because you can customize it. You’re not restricted to one design therefore, getting the unit you need for your specific environment is made simple. You can add temperature regulating systems and protect your equipment against the effects of a hot or cold environment. The unit provides more than just protection, it provides a harmonious environment that extends equipment lifespan and allows your apparatus to function at maximum potential. The classic industrial computer cabinet is at the forefront of PC, printer and screen protection delivering long-term results that help you to avoid expensive costs. The value of the unit is unlocked over a long-term period. No longer will you have to worry about the cost of engineer call-outs or repairing/replacing damaged equipment. You also save time as you will no longer need to worry about dealing with insurance claims or suffer disruption to workflow because equipment can’t be used. You stand to save your business time and money year-after-year. With the capacity to accommodate PCs, screens, printers and keyboards, without the need to purchase separate enclosure solutions, this industrial computer cabinet represents magnificent value for money. Being able to store your PC, screen, printer and keyboard all in one place is not only convenient, but keeps worktops clear, giving you more space in which to work. The unit is delivered fully assembled, ready for use so you waste no time assembling the product. Once installed, your equipment will require minimal maintenance as the unit creates an environment that allows your apparatus to sustain itself. The unit itself is also low-maintenance. It’s easy to clean and resistant to corrosion. This unit is built to last! Discover if the industrial computer cabinet is suitable for your environment. You’ve got nothing to lose! For a FREE suitability assessment for your workplace, use the ‘Quick Enquiry’ service on our website and we’ll contact you. For a quote, or to order your industrial computer cabinet, call 1-866-434-0807. For peace of mind, visit the Armagard manufacturing facility and see how we build your enclosure. Give us a call to arrange an appointment to visit us on site. We want the purchase of your industrial computer cabinet to be a risk free investment. This entry is filed under industrial enclosure, Nema 4. You can follow any responses to this entry through the RSS 2.0 feed. Both comments and pings are currently closed.